Pic of the day: Connections. 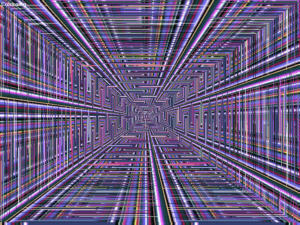 Screenshot from the Chromazone screen saver. It feels like a human lifetime ago, but in truth it must have been the early 1990es, because I reviewed such games as The Elder Scrolls: Arena and Sid Meier's Colonization. One or two of my screenshots even showed up in a national advertising campaign for that game, not that I ever got a dime for that. I can't even remember if I got the game for free. Sometimes I did, sometimes not. Even then I didn't concern myself overmuch about money. What I did was write for the Norwegian computer gaming magazine Databladet, which is now faded away years ago. A good friend, a honest and serious and spiritual young man (around my age) talked to me about this activity of mine one day. "Lay a ruler on your life" he said. "Today you are writing articles for this magazine, in the future you might end up as editor-in-chief." It was pretty clear that he saw this as a fate roughly as bad as death. To be honest, I am not thrilled about such a fate myself, but it didn't come to pass. What happened was that the editor went on to found one of the more popular gaming sites, ToTheGame.com, together with some of the people I wrote together with, and some others. I, however, went on to continue to be a Christian mystic, a computer gamer, a hobby philosopher, an economist and all the other things you can find reflected in the Chaos Node. There are always plenty of those willing to take on positions of responsibility. Rarely this is because they are responsible by nature, but more commonly because they want the glory and the money. But I still hold them to it. And I have very small interest in all of these things. A little money is necessary for the good life, and a little responsibility is impossible to avoid. But for the most part, I prefer to live a quiet life. I don't want to be an editor, or a boss, or a church leader. I just want to be me. It may look strange to you, the combination of things I do. Probably they seem unrelated. Even with all that I write, I am not sure if you can see the connections... no, that is not even it. Connections imply that things are separate but there are bridges between them. But to me the different facets of my life are joined in one whole dome, without separate rooms really. Of course not all things are next to one another, but they are all part of the same reality. Even the virtual reality. I know of course the difference between fantasy and reality, but I myself is the same person whether I am here or there. The reason why I can stretch so far in so many directions, is that I trust my core to be solid and keep me together no matter what. Even things like science and religion, which many people feel are in conflict, are not for me. They occupy different places but there is only one truth. Of course there is conflict of interest in my life, but it is a conflict of will, not of perception. I sometime think that the single-minded must achieve so much more, by concentrating on one thing. And to some degree I believe this is true. You will never get really far if everything is just as a hobby to you. But I also find that people who go far, don't always go in the right direction. Those who specialize, zoom in so close on their particular area, so they may lose sight of everything else and no longer know where they are. This can happen in a job, where people become "profession idiots" to translate a common Norwegian expression. It can even happen in religion, like with those guys Jesus spoke about who were careful to tithe of all their small garden herbs, but forgot the things that were important in the Law, like mercy. Who am I to think that I would fare so much better if I narrow my vision? So I stay here, doing what I do best: See the connections that span my world, an endless web of connections that bind everything together. This is my life, and I share it for free with anyone who will accept it. At a safe distance, of course.